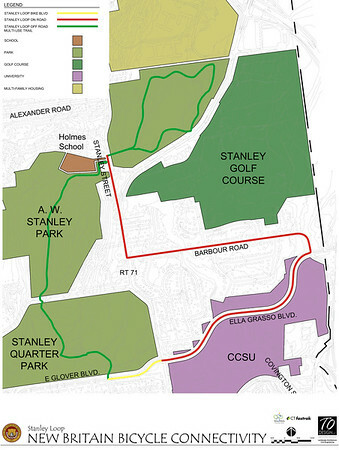 NEW BRITAIN - New Britain completed the first phase of the city’s Stanley Loop Trail on Sept. 5. The entire trail, which will run through Stanley Park and Stanley Quarter Park, will be completed within the next two years and feature “multiple” miles of paved walking and cycling trails beginning on the eastern side Stanley Park near Lower Pond. Contractor Tobacco & Sons recently finished paving the 10-foot wide path. Both phase 1 and phase 2 of the project are being funded by a $3 million grant awarded to the city. The reason for the specific location, New Britain said, is because some of the city’s most populated areas, like Central Connecticut State University, are located there. Stewart added that the trail could help “many of our students” who may be falling short in achieving physical education standards. She also said that it could help reduce the city’s “high rates” of asthma and cardiovascular disease if used frequently. Still, the Loop Trail stems from the fact that New Britain is only one of nine towns in the state to have received the “bronze” level status from the City’s Bike Connectivity Plan. A 200-foot-long “connector trail” was also added to connect Village Square Road to the park. “The idea with this project is that even though we have been installing a lot of bike infrastructure around the city, there was a need for families to go and ride or access natural environments aside from Walnut Hill Park,” Public Works Director Mark Moriarty said in a press release. An official ribbon cutting for the trail will be held on Friday, Sept. 14 at 3:30 p.m.
Posted in New Britain Herald, New Britain on Friday, 7 September 2018 20:26. Updated: Friday, 7 September 2018 20:29.